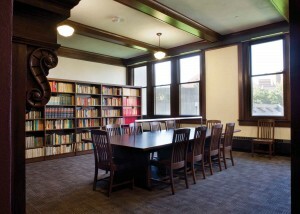 The University of Minnesota's historic Folwell Hall completed three years of extensive renovation, just time for the 2011 academic year. Students, faculty and staff now enjoy a more comfortable, energy-efficient interior without sacrificing the exterior's classically collegiate character. Contributing to this delicate balance of architectural preservation and modernization, Kolbe provided nearly 500 traditionally styled, high performance, low maintenance windows. A fixture on the National Register of Historic Places, Folwell Hall's Jacobethan architecture was inspired by the English Renaissance Revival style. Clarence H. Johnston, Sr., served as the architect-of-record on the 1907 building and on many other iconic, Minnesota structures. In addition to Folwell Hall, he designed the University's Northrop Auditorium, Walter Library, Williams Arena, a number of buildings on the St. Paul campus, and the original Grandstand at the Minnesota State Fair. Folwell Hall's exterior combines Jacobean and Elizabethan styles of architecture in an array of gargoyles, sculpted faces and animals; 28 decorative, naturally-ventilating chimneys; flattened, cusped Tudor arches and steep roof gables; terra-cotta brickwork; and lighter stone trims around the windows and doors. Although the $15 million exterior renovation restored much of the grandeur, the 127,700-square-foot interior still left much to be desired. Stairwells were too narrow for emergency stretchers, offices were cramped, and the more than 12,000 students that met in Folwell's 30 classrooms were at the mercy of wildly fluctuating temperatures caused by outdated, inefficient windows and an antiquated HVAC system. "With some of these classrooms, you have a choice between very noisy or very uncomfortable," said Gary Oehlert, associate dean for planning in the College of Liberal Arts in an interview with the Minnesota Daily". "Turn on the air conditioner on and you can't hear. Turn the air conditioner off and everyone roasts." The building's $34.5 million interior renovation project set out to remedy this problem by replacing 400 existing windows with new energy-efficient units from Kolbe. National Window Associates, Inc.; selected Kolbe's Ultra Series Sterling double hung units with standard LoE²-270 double-pane insulating glass to meet the University's requirements, as guided by Miller Dunwiddie Architects and McGough Construction. "Miller Dunwiddie is involved with a number of preservation projects, including many on the University's campus. Two of the main goals for Folwell Hall were to protect its historic significance and to improve its energy efficiency," reiterates Miller Dunwiddie's project manager, Denita Lemmon, AIA. "Kolbe's very large double hung window system met the both the aesthetic and performance specification. State-bonded building projects must meet B3 Minnesota Sustainability Building Guidelines." B3 stands for "Buildings, Benchmarks and Beyond." Minnesota legislation requires compliance with Minnesota Sustainable Buildings 2030 (B3-MSGB Version 2.1). These guidelines are designed to be compatible with national guidelines, such as the U.S. Green Building Council's LEED® Rating System. Under Minnesota's B3 guidelines, both new construction and major renovations must exceed the state energy code by at least 30%. "Sustainable design is a means to reduce energy expenditures, enhance the health, well-being and productivity of the building occupants, and improve the quality of the natural environment," according to the MSGB website. "All of these can contribute to high-performance buildings with lower life cycle costs. To move toward ensuring these outcomes, the guidelines attempt to quantify the human, community, environmental, and life-cycle economic costs and benefits for each project." National Window Associates' sales manager, Jim Christiansen, elaborates, "For the prestigious Folwell Hall renovation, we helped emulate the original windows. The building's century-old wood windows had been replaced in the 1980s with a basic, aluminum system, which had hidden some of the historic, architectural details. The replacement system we recommended integrated Kolbe's aluminum-clad wood windows with custom, aluminum panning to replicate the original, architectural vision." Lemmon adds, "With the 1980's replacement system, we couldn't exactly match the originals. We had some photos, and when Folwell Hall's exterior was restored, historic trim was discovered underneath the '80's aluminum panning." "To retain as much of the historical nature of the window openings the interior trim was left in place," says Tim Mahanna, McGough's project superintendent. "Over the years the trim sustained quite a bit of damage. The cracked, removed or damaged trim was replaced. It was a bit of a challenge to replicate this trim, as the profiles of the existing trim are not available today. We removed many samples of trim from the existing window openings. Our supplier had a machine shop cut new 'knifes' for the shaper so that the new replacement trim matched the existing profiles. All of the existing trim was stripped, re-stained and several finish coats were applied to achieve the 'new' look. Working closely with Kolbe on the stain color, we were able to achieve a really nice match." Kolbe created custom "Folwell" finishes: The interior trim mimicked both color and grain with white oak stained to a deep, dark brown. The exterior's recycled aluminum was painted in a custom gray 70% fluoropolymer, which is tested to meet AAMA 2605-05, the industry's most stringent performance requirements for finishes. "All of the windows are rectangular in shape, but custom in size. There are 16 different window sizes on Folwell, the largest of which is 38-3/4 x 92-1/4," notes John Fenn, Kolbe's estimator in commercial sales. "Regardless of the dimensions, the windows are crafted for a uniform, traditional appearance and smooth, easy operation. Special keyed custodial locks were added to secure the windows." Fenn continues, "For this large project, Kolbe shipped the units in phases. As each Kolbe trailer of windows was delivered, the field crew worked its way around Folwell Hall, floor by floor, elevation by elevation." McGough's on-site team removed and replaced the existing windows throughout the cold Minnesota winter, from November 2010 to March 2011. "Kolbe delivered as promised. We were impressed with the quality of the product," says Mahanna. He explains that much preparation was needed on the building before the first Kolbe window in place. "There was asbestos caulking and lead paint that had to be abated and remediated, respectively. After that process was completed by the U of M contractor, our crew started the process of installing the windows." * preserving the marble and terrazzo floors, original doors and ornate woodwork. Addressing the achievements of Folwell Hall's renovation, Scott Elton, assistant to the associate dean for planning in the University of Minnesota's College of Liberal Arts, stated, "The environment in which students learn is... dramatically improved, both in terms of the HVAC/sound issues and comfort, and also in the connectivity of the classrooms to the world." Joining the University in their praise, Folwell Hall's renovation team has earned many accolades including from the City of Minneapolis Community Planning and Economic Development Department, Finance and Commerce's Top Projects, the Minneapolis Chapter of the American Institute of Architects' Merit Awards, The Minneapolis Heritage Preservation Commission, Preservation Alliance of Minnesota, and Preserve Minneapolis. Folwell Hall, 9 Pleasant Street SE, Minneapolis, Minn.
* Window distributor: National Window Associates, Inc.; Rogers, Minn.
* Window manufacturer: Kolbe & Kolbe Millwork Co., Inc.; Wausau, Wis.
DALLAS, Texas, December 22, 2011 /PRNewswire/ --ReportsnReports adds new market research report 'Solar Photovoltaic (PV) Power - Global Market Size, Installation Prices, Module Market Shares, Market Segmentation, Regulations and Key Country Analysis to 2020' to its store. New Product Allows Building Windows to Become "Solar Farms"
Proprietary laminate windows collect, store energy; convert it to electricityRIVIERA BEACH, FL – An innovative new patented technology transforms office building windows into "solar farms" and allows these structures to reuse collected energy and become self-sufficient in the event of a power outage. We sincerely thank all our members, friends and visitors for being part of GlassOnWeb and its success during 2011. Michael Gai has been named Vice President of Operations at Glass Doctor, following the recent promotion of Mark Liston to President. COLUMBUS, Ohio – Dec. 19, 2011 – Safelite AutoGlass®, the nation’s largest provider of vehicle glass repair and replacement services with a fleet of 6,000, announced it will transition to Ford®. The renewal process for AAMA Corporate Members is now open. AAMA Corporate Membership is available to businesses involved in the manufacture, sale or service of fenestration products and is renewed on an annual basis.